Diagnosis and treatment children with acute scrotal pain was ivestigated in different work. The acute painful scrotum is one of the most challenging urological emergencies. Making the correct diagnosis of testicular torsion, torsion of a testicular appendage, or acute epididymitis can be difficult because pathognomonic findings are infrequently present. Delayed diagnosis and treatment can potentially lead to irreversible parenchymal damage and loss of a testis. The most famous work is “Multicenter Assessment of Ultrasound of the Spermatic Cord in Children With Acute Scrotum” by Nicolas Kalfa et al. In this papper among 919 patients from 11 European university hospitals underwent color Doppler sonography and high resolution ultrasonography for acute scrotum between 1992 and 2005. The spermatic cord was studied along its complete length to detect a spiral twist. The surgical findings were correlated with the preoperative results. High resolution ultrasonography based management of acute scrotum is reliable and reproducible. Thanks to its high sensitivity and specificity for the diagnosis of spermatic cord torsion, high resolution ultrasonography can significantly improve the management of acute scrotum in children . In the study “Diagnosis and treatment children with acute scrotal pain. Twenty years single centre experience.” by Sergey Minaev, Yuri Bolotov was to determine the value of Doppler ultrasonography in the diagnosis of acute scrotal pain in the different stages of acute scrotum. 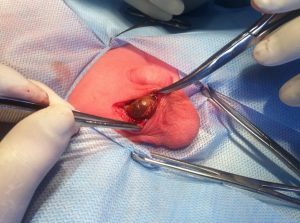 The case notes of 344 boys with an acute scrotum aged from 1st day of life to 17 years old were reviewed in the Department of Pediatric Surgery of StSMU (Russia). The size and ultrasonography structure of the testis and its epididymis, as well as the testicular blood flow, were assessed. The sensitivity of ultrasonography findings for testicular torsion without scrotal edema was relatively low (50%), but with scrotal edema – increased to 83.3%. The specificity of sonography for testicular torsion in the presence or absence of edema of the scrotum did not change significantly (83.2%). The characteristic ultrasonography evidence of torsion of a testicular appendage was an increase in size of the epididymis and its heterogeneous echostructure. The sensitivity of these signs was high (83.3%) in all boys. The sonography signs of acute epididymitis are an enlarged epididymis and its homogeneity. The sensitivity (83.3%) and specificity (87.5%) of the findings did not depend on the presence or absence of scrotal edema. Operative exploration was performed on 240 patients. Surgical findings were: testicular torsion – 61, torsion of a testicular appendage – 164, acute epididymitis – 20. Thus, the sensitivity and specificity of physical examination signs of the acute scrotum in the absence of scrotal edema in children are higher than the ultrasonography findings, but significantly drops after the onset of scrotal edema . In the book “Acute testicular disease in children” by Yuri Bolotov and Sergey Minaev was investigated boys with Acute Scrotum. The Doppler US is a highly sensitive preoperative diagnostic tool for scrotal pain. The sensitivity and specificity of physical examination signs of the acute scrotum in the absence of scrotal edema in children are higher than the US findings, but significantly drops after the onset of scrotal edema . 2 – Sergey Minaev, Yuri Bolotov Diagnosis and treatment children with acute scrotal pain. Twenty years single centre experience. Meditsinskii Vestnik Severnogo Kavkaza. – Medical News of North Caucasus. 2015; 10(2): 117-120. 3 – Острые заболевания яичка у детей: Практическое руководство / Ю.Н. Болотов, С.В. Минаев. – М.: НИЦ ИНФРА-М, 2014. – 107 с.
В своем мультицентровом исследовании Н. Кальфа показывает диагностическую значимость, пожалуй, единственного патогномоничного ультразвукового симптома перекрута яичка – спирального скручивание семенного канатика “в виде улитки”. Несмотря на положительные отзывы о точности этого симптома со стороны зарубежных и центральных отечественных клиник, наш опыт показывает очень низкий процент выявления этого симптома на уровне участковых поликлиник, центральных районных больниц и других учреждениях первичного звена. В связи с этим, мы в своих работах рекомендуем использовать другие ультразвуковые симптомы, которые с легкостью могут выявлять и интерпретировать врачи УЗИ диагностики первичного звена вне зависимости от их квалификации и уровня ультразвукового оборудования.